Rosacea Awareness Month. What treatments can help to combat this skin condition? 60% of people in the UK currently suffer from some form of skin disease and rosacea is amongst the most common of the facial skin rashes. It is thought to ‘run in the family’ and more than half of patients in a recent survey found that they had another family member with the condition. Rosacea causes a flushed, reddened outward appearance on the skin but can also cause the skin to feel very sensitive or even like it is burning and stinging. It usually begins with the skin on the cheeks flushing easily but can spread to the nose, chin and impact on other areas of the face. Some people who suffer from rosacea may also experience small, pus-filled spots and a red bumpy appearance to the rash (papules). Small red streaks caused by dilated blood vessels (telangiectasia) can also add to the facial redness. 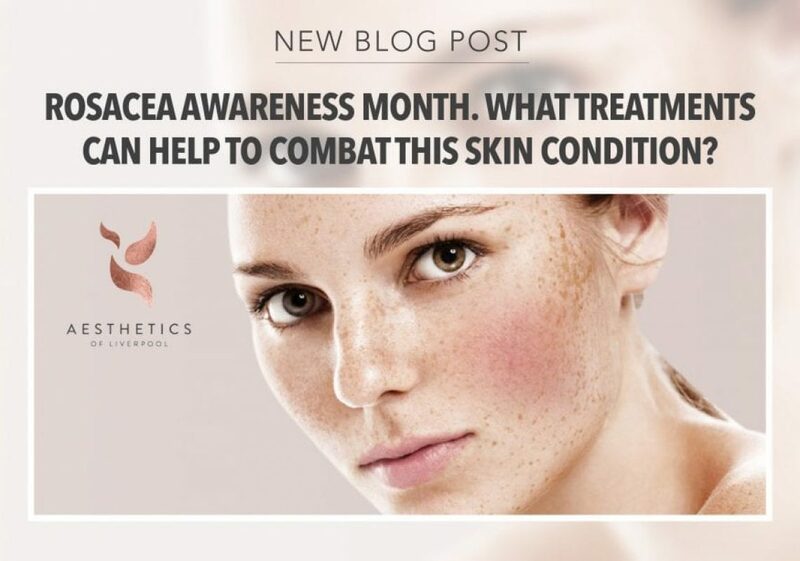 April 2019 marks Rosacea Awareness Month, but what is the #RosaceaNoFilter campaign all about? Galderma, which is part of Nestlé Skin Health’s medical solutions business has had an ongoing commitment to raise awareness of this misunderstood condition. This month, they will be collaborating with some of the top social media influencers with the hashtag #RosaceaNoFilter to encourage people who suffer with rosacea to share their experiences. The instagram @rosacea_beyondthevisible has been sharing stories of people living with the condition throughout April. The National Rosacea Society said that: “The goal of Rosacea Awareness Month is to spread public education on this disease so that more people who may have rosacea seek medical help before it gets worse, and so those whose lives are affected can find greater public acceptance and understanding”. Many people with rosacea have reported frustrating conversations with medical advice that hasn’t helped them. Instead, they may have tried over-the-counter products for short-term relief rather than seeking expert advice. At Aesthetics of Liverpool, we want to change this and show people who suffer with rosacea that there are treatments which can be really effective against this condition. The good news is that you do not have to simply suffer from this condition – there are steps that you can take to drastically reduce and alleviate the symptoms of rosacea. It is entirely possible to follow a bespoke treatment plan at Aesthetics of Liverpool that will help to ease your pain symptoms, red flushing and the overall appearance of the rash and most importantly, get you back to feeling like you again. If you have been suffering from rosacea, then you will know just how disheartening, embarrassing and upsetting this condition can be. This study looks at the emotional turmoil which can come with having rosacea – we want to change this. With the condition being widely misunderstood, there is the added problem that many sufferers can be left feeling confused about a cure or the treatment options that are available to them. Some people have even been misdiagnosed with acne, psoriasis and other severe skin conditions, which makes knowing how to treat the rash problematic. At Aesthetics of Liverpool, we are experts in the treatment of rosacea and we can work with your individual needs. What treatments are available at Aesthetics of Liverpool for rosacea? E-light I-plus helps to combat and reduce the effects of facial redness caused by rosacea. The E-light I-Plus combines both RF (radio frequency) & IPL (intense pulse light) technology and works by firstly using the IPL to preheat the target area of the skin condition. Once the area has been treated, a thermal path is created where the radio frequency energy can travel to the site of the skin condition and start to work the skin cells. After this process, electromagnetic energy is expertly sent directly to the targeted vascular and pigmented areas of the skin.This treatment is able to offer outstanding results and substantially improve the frustrating, uncomfortable condition that is rosacea. E-light plus is a totally comfortable treatment with no painful side effects. You can return to your normal daily activities straight after you leave our clinic. This fast, reliable and outstanding rosacea treatment will get you feeling fantastic and confident in your own skin. LED light therapy has become increasingly popular in recent years with many patients reporting that after years of trying other treatment options light therapy has truly worked for their rosacea skin condition. NASA originally developed and utilised light therapy to encourage the growth of plants and to aid the treatment of injured astronauts while in space. This technology has now been brought to the mainstream and can be used aesthetically to target a wide variety of difficult skin conditions including the chronic condition rosacea. For rosacea treatment, the colour wavelengths are able to penetrate the skin; this light energy targets underlying tissue to trigger collagen production and other biochemical mechanisms leaving skin bright and rejuvenated. Studies into how light treatment works suggest that the light is taken in by the mitochondria in the skin cells. This absorption of light, in turn, stimulates collagen production which is the essential building block of healthy skin. Using this treatment to target rosacea can reduce the feelings of tightness and itchiness that rosacea causes and in turn reduce the redness. LED light will also help to restore the moisture of the skin to help create a much more even skin tone and overall appearance. Another option is a specialist skin peel. Skin peels help rosacea by exfoliating the top layers of skin, speeding up skin turnover and working to prevent the pores from becoming clogged with dead skin cells, which can aggravate rosacea. They can also help to reduce inflammation and promote skin healing. Our peels vary in strength and we will recommend which one is best for you. Photobiomodulation, also known as Low level laser therapy (LLLT), was found to be able to stimulate growth in cells over 50 years ago. Today, LLLT is used in three main ways – to reduce inflammation, chronic joint pain and edema and also, to stimulate the healing of wounds, deeper tissues and nerves. LLLT utilises multiple wavelengths of light energy to reach skin tissue at underlying levels and can be used to treat a wide range of skin conditions including rosacea. If you’ve been suffering with this condition and need help then get in touch this Rosacea Awareness Month. With us you can expect a professional service and friendly advice that you can trust. We will work closely with you to carefully select the best treatment choice to help you get started on your journey to feeling like the best version of you.